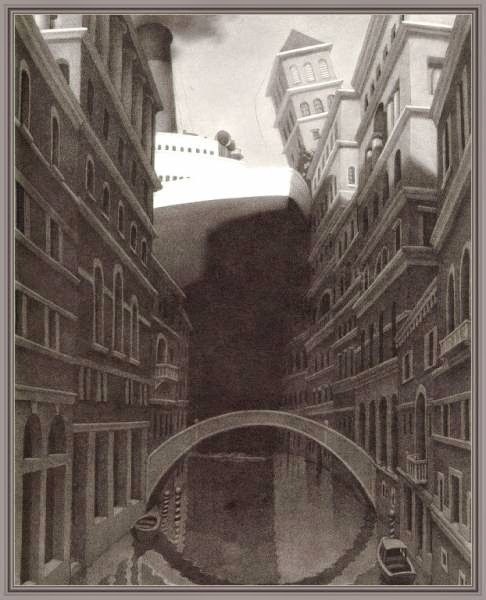 The following is a short story based off of the image titled Missing in Venice from The Mysteries of Harris Burdick by Van Allsburg. Countless people have written their own versions of the stories found in his book and this my addition to that collection. Even with her mighty engines in reverse, the ocean liner was pulled further and further into the canal. The ship was in chaos, everyone was clamoring to know what was going on. People swarmed the edges peering over the side of the ship at the buildings they were just squeezing past. Crowds clamored at the door to the control room demanding to know what was going on. Atea wasn’t worried about their situation, in fact everything was going as planned. Under the cover of all the chaos she was making her way carefully through the inner parts of the ship towards her goal. She’d been planning this heist for years and excitement at how well it was working bubbled up within her threatening to burst out in laughter. But she had to keep it in, at least until she was finished. Then she could celebrate. Her attention was focused on her goal and she swiftly made her way through the empty hallways of the ship’s interior to reach the cabin she was looking for. The lock was simple to pick and soon she was in the cabin looking at the sparse, but richly decorated room. The cabin was larger than most and the occupant had paid highly for the privacy it granted, being far from any other rooms it was almost forgettable in it’s corner of the ship. Exactly the way both Atea and her mark liked it. The safe was right where she knew it would be, hidden in the wall above the bed. Having helped design the boat herself Atea was one of the few people who knew about the secret location. The safe opened as quickly as the door did under her experienced hand and she took a breath in anticipation as she pulled the obscure brown box out of its hiding place. To anyone else its contents would be paltry, unworthy of all the trouble she’d gone through to acquire it. But to Atea the content’s were priceless, years of her life sat safely in the box and she was finally getting them back. She pulled a fake box out of her bag and put it in place of the old one tucking her prize into her bag. After locking the safe once more and making sure she left no trace in the room of her ever being there she slipped back out of the room locking the door behind her. Her trip back onto the main deck of the ship passed quickly and soon Atea found herself blinking in the bright Venice sunlight. The ship was still on course through the canal and she pushed her way forward to get a good look out at the city. People looked in awe at the ship as it passed by and Atea couldn’t help but wave at a few of them her joy at her victory showing in her smile and carefree stance. Soon the ship would reach it’s destination, and then she’d finally be free.